This week the Government of Norway is hosting the Education For All High-Level Group Meeting in Oslo to discuss progress made and challenges faced in providing quality education for all children. 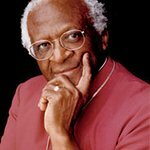 Among the signatories was the South African human rights activist, Archbishop Desmond Tutu, who won the Nobel Peace Prize in 1984. Last week the Archbishop spoke with UNICEF about his views on education, drawing on the experience of South Africa today and during the apartheid era. But the opportunity to go to school is not a reality for many children in the poorest countries and communities around the world. In South Africa, Archbishop Tutu pointed to schools that were under-resourced and neglected in black communities. “Generally, the air around many of these schools – and there are very many expectations, it is true – but generally it is true to say that the atmosphere around these schools is very depressing,” he said. At the Education For All meeting, governments, donors, development agencies and educators are tackling the most pressing issues in education: weak governance and management, unmet financial needs and commitments, and a critical lack of capacity – particularly a shortage of qualified teachers. All of these elements are critical to building sustainable education systems that nurture young leaders who will be at the helm of schools, local communities and national governments in the future. Without continued investment in education, communities will see the gains they have made in recent years dissipate as their youth are left behind, participants agreed. Archbishop Tutu has been a relentless advocate for human rights and has seen change in South Africa and beyond. He knows well the value of an informed, educated population of young people.